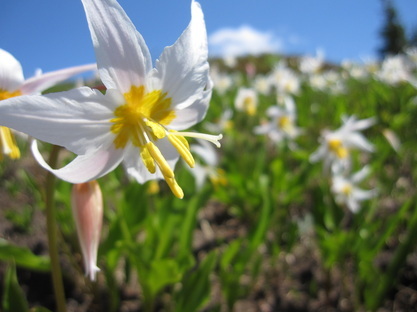 We need your help collecting photos of wildflowers in Mt. Rainier National Park to understand the impacts climate change will have across the park. Each photo represents one phenological observation, and affords us the ability to document phenology across the entire park rather than just one or two trails. With each photo in the collection, the phenological patterns become clearer across the mountain as a large spatial extent complements our intense data collection efforts. All photos must be taken within Mt. Rainier National Park (either geo-tagged or lat/long recorded manually), date stamped (automatically or manually recorded) and of a wildflower (in any phenological stage). While we are primarily focused on sub alpine flowers, feel free to upload photos of flowers that occur in any climatic zone. For hike ideas check out these trails! Grand Park, Spray Park, Huckleberry Creek, Berkeley Park, Van Trump Park, St. Andrews Park, Summerland, Forest Lake, Seattle Park, Burroughs Mountain. For many more hikes check out the WTA Hiking Guide. Follow the directions below to upload your photos from this year or any prior years. Facebook, Yahoo etc., or you can create an iNaturalist account for free. On the home page, click on Projects and search for “MeadoWatch”. and then”MeadoWatch” from each individual observation page. or Facebook) or create an account for free. Please do not forget the phenological state! all and the Lat/Long is entered manually.